Titan is one of the first cuys we rescued! Check out our NEW Cuy Training Guide! The cuy mejorado or improved cuy (referred to simply as “cuy” by rescue organizations in Southern California) was bred through natural selection from cuy criollos (your average domesticated guinea pig), by the INIEA (Institute for Investigating Experimental Agriculture) in Peru in the 1970s through early 2000s, as "commercial" breeds (rather than pets) to help address poverty and hunger in regions where no other livestock or large agriculture could be developed. Broadly speaking, “improved” cuys are selected to be more muscular, with floppy ears, rectangular bodies, high growth rates and quiet temperaments. The Peruvian line was developed to produce animals that gain weight more quickly, weighing in at 800g by 2 months old. The line has smooth red and white coats. The Andina line is characterized by large litters due to early postpartum heat. They have a smooth white coat and black eyes. The Inti line has features of both Peruvian and Andina (size and fertility). These cuys have black eyes and fawn and white coats, sometimes with a crest. Other cuy mejorado breeds include the Inka (large red and white Abyssinians), the Mantaro (red with some white, sometimes crested), and the Saños line (1000g by 8 weeks). “Mestizo cuys”, also known as cuy criollo mejorados, are the result of cross breeding cuy mejorados (the “improved” breeds) with cuy crillos (standard guinea pigs). These mixes can have coarser fur than standard guinea pigs. In addition to their increased size and growth rate, cuy tend to be extremely nervous, and their bulk and strength means that they can be much more difficult to handle when scared. They are easily capable of jumping out of C&C cages (approx. 14 inches), and can run very fast, so are difficult to catch and require an experienced home. They also have impressive appetites! Although cuys can live with standard-sized guinea pigs, it seems that an increasing number of young female cuy have social difficulties and can be very dominant, especially with other female guinea pigs. California pet stores have been selling cuy as pets (particularly the Peruvian, as well as the occasional Andina, and now, increasingly, mestizo cuys). 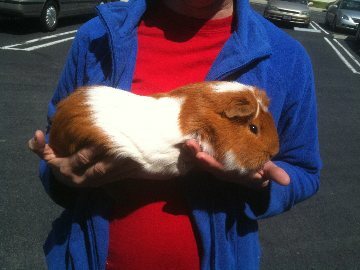 The sales associates are often not aware of what cuy are or how big they will grow, so buyers need to be especially cautious, and look out for tell-tale signs, such as distinctive coloring and large ear and foot size relative to other babies, and extreme fear of being picked up, since coloring might be less obvious in cuy “mixes” (mestizos). Unfortunately, the pretty coloring of cuys makes them attractive purchases to uninformed buyers.